AquA AnimaniA has anything and everything you could possibly need for your cute and playful small animal pet. Keep your small animal entertained for hours with AquA AnimaniA’s variety of small animal toys, small animal tunnels, small animal tubes and small animal hideouts. When your furry friend is looking to wind down after an active day, AquA AnimaniA has great small animal beds, small animal hammocks and small animal sleepers to choose from. 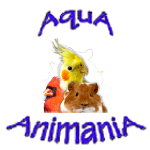 Treat your small animal well (and your wallet better) with small animal supplies from AquA AnimaniA!